A while back some guy over at the My Little Game Dev forums thought it would be funny to make an Equestria Girls game with dubstep, lousy textures, and annoying audio. 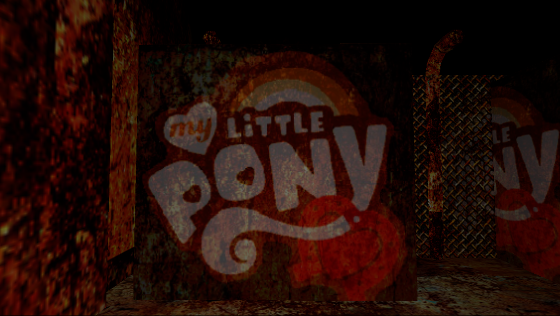 The resulting project took a mere two days to make, and along the way somehow turned into A World You Should Not Know: a horror game starring Twilight Sparkle as she tries to retrieve the magical crown from...whatever. Sunset Shimmer isn't involved at all: the story is basically just an excuse for the game. The review continues after the break, as usual. According to AWYSNK, the alternate universe explored in Equestria Girls is actually just another one of your typical, not-so-abandoned facilities you find lying about everywhere in video games, and the aforementioned crown is locked behind some sort of cruddy door that requires six keys to open. For no reason in particular these keys are guarded by warped version of the mane six, who evidently have been just sitting in there, waiting around for some idiot to wander in without a shotgun so they could chase them down and make pony hamburger. Regardless of the weird premise, the game actually manages to be surprisingly scary due to its heavy use of claustrophobic spaces and creepy breathing made by your foes. Being stalked by anthro ponies may sound and look silly from the screencaps, but trust me; it is anything but ridiculous. 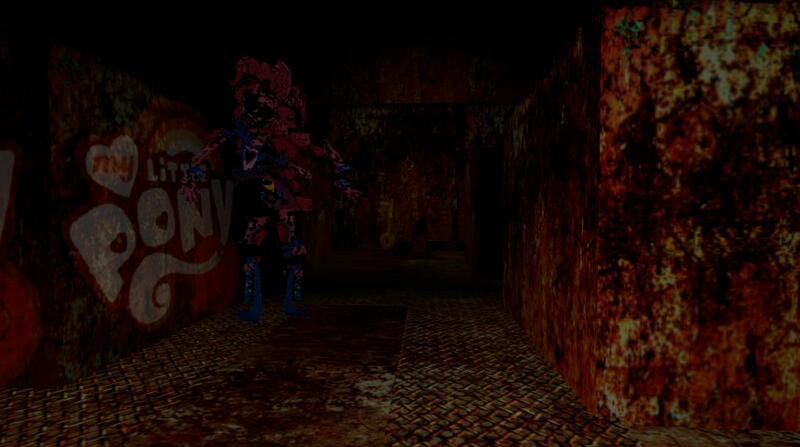 Their messed-up textures and truly bizarre animation is quite disturbing to behold as they take massive strides towards you with their freakishly long legs, following you through the rusty corridors. Neither words or pictures can convey how terrifying these things are in motion. Speaking of rust, the textures in this game are of a rather low resolution when compared to most of its modern contemporaries, although you probably won't be paying too much attention to them while peeking around the corners, carefully listening to see if you can hear any nearby footsteps or breathing. The darkness tends to make it difficult to see any stalkers until they're really close, so it's advisable to play the game with headphones. A map is also included in the game folder, which the player may consult if they're feeling too lost. I really don't know what else to say about A World You Should Not Know, or if there is anything else. The game wasn't bad or anything, but for various reason I've never really found this genre very interesting, although those of you who are into horror games might enjoy this. I'd still say that Derp Till Dawn was a much better game overall (and that it deserved a higher score than I gave it), so I'll just slap a 5 on this and be done with this review so I can get on to adding Twilight Wing to the Arcade.